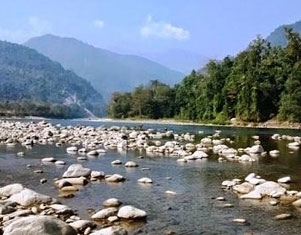 North East India ,Seven sister states ,Unexplored Slice of Paradise and we have many more name for this tourism Destination. North east india is destinations who loves wildlife tours, adventure tours, who want to see Snowy Mountains,Want to Explore the best falls . North east tourism has many more thing to explore. Meet and greet at Guwahati Airport/Station and drive to Shillong. En route witness the Umiam Lake or Barapani - is the biggest artificial lake in Meghalaya in midst of sylvan hills adorned by Khasi pines & peerless beauty. Check-in Hotel and after refreshment if time permits visit Cathedral of Marry and Ward’s Lake. Evening free at leisure to explore the region on own. You may take a walk to the famous Police Bazaar for shopping. Overnight in Shillong. After breakfast drive to Cherrapunjee, the wettest place on the earth, for an awesome day trip. En route visit the famous Elephant Falls. At Sohra, stop at the Duwan Sing Syiem view point for mesmerizing views of the Hills. In Cherrapunjee be witness to the gorgeous Seven Sisters Falls and Nohkalikai Falls. Later take a soft cave walk inside the Mawsmai Cave. The limestone cave is a natural wonder with innumerable formations inside it. After lunch at Cherrapunjee, visit Thankarang Park. Drive back to Shillong for overnight stay. After breakfast transfer to Bhalukpong, a town on the Assam – Arunachal Pradesh border & overnight stay. Morning after breakfast, drive to Dirang (4910 ft). Enroute visit Tippi Orchid Centre. Arunachal, the ‘Orchid Paradise’ is famed to have the largest variety of orchids in India. The Orchidarium at Tipi shelters 500 or more varieties of orchids which are available in various parts of Arunachal Pradesh. It is a premier Institute of excellence in orchid research and development, under the State Forest Research Institute (Department of Environment and Forests , Arunachal Pradesh). Check in Hotel. Evening at Leisure.Overnight at Dirang. Morning after breakfast, drive to Tawang (10,000 ft). En route witness the unique Dirang Valley famous for its monasteries, hot Springs, Apple & kiwi Orchards, sheep breeding farms & charming valleys. Also witness the snowcapped Sella Pass at 13700 ft, the JaswantGarh War Memorial and Jung Falls. Overnight in Tawang. JaswantGarh War Memorial : Legend has it that Jaswant (Mahavir Chakra Awardee (Posthumous) of 4th BatallionGarhwal Rifles), fought a lone battle against the invading Chinese during the 1962 war. His spirit is still believed to protect the place. SelaPass : @13700 ft, the Sela Pass is is snow-covered (full or partial) all through the year and has breathtaking mystic views. Close to the Pass is the beautiful Sela Lake, a heart-shaped lake chiseled between the mountains, which intensifies the beauty of the region. The Lake is mostly frozen in winter. The Sela Pass is the main route to access Tawang town and is located 78 km before reaching Tawang. Jung Falls :The Nuranang falls (original name) @6000 feet is located about 40 km before reaching Tawang is famed as one of the most stunning waterfalls in North East India. The falls height is about 100 meters. The legend about the waterfalls goes that it is named after a Monpa girl Nura who aided an Indian soldier during the 1962 Sino-Indian War. Tawang is the beautiful land of the Monpa tribes. ‘The Land of Dawn-lit Mountains’ at 3500 mts gives you unparallel purity of nature. After breakfast, visit the Tawang Monastery, Urgelling Monastery, AniGompa and PTso Lake. The Tawang Monastery, also known as the “GALDEN NAMGYEL LHATSE” is one of the largest Lamaseries of Mahayana sect in Asia and is the largest of its kind in India. The Monastery is 400 year old and is adorned with the 18 feet high statue of Lord Buddha. It stands at 10,000 feet amidst the exotic Himalayan ranges and overlooks the Tawang-Chu valley. The Urgelling Monastery is located 5 km from Tawang city, and is the birth place of the 6th Dalai Lama, born in the 17th century. The monastery was established by the Lama UrgenSangpo in the 15th century. Mongpa village visit will acquaint a visitor to their lifestyle, culture and traditions. The villages are located amidst exquisite beauty. Later visit the War Memorial commemorating the bravery of the Indian heroes of the Indo-China war of 1962. Witness the light & sound show in the evening. Overnight in Tawang. Morning drive back to Bomdila.Evening free at leisure.Overnight in Bomdila. Kaziranga, the World Heritage Site is the oldest park in Assam & is located on the banks of the Brahmaputra River. Kaziranga National Park is a natural habitat for conservation of biologically diverse flora & fauna. It is inhabited by the world’s largest population of one-horned rhinoceroses besides sheltering about 15 species of India’s threatened mammals. There are numerous other major wildlife fauna. Early morning go for Elephant ride @ 5:00 am. Return for Breakfast to hotel. After breakfast proceed for Jeep safari in the Central Range. With Kohora as the entry point, the Central Range covers the Daglang and Foliomari area. Later enjoy Local Village & Tea Garden (Outer View) tour. Overnight at Kaziranga. In the afternoon you may take an optional Jeep Safari (at ADDITIONAL COST) in Western Range of Kaziranga National Park. With Baguri as the entry point, the range covers the Monabeel, Bimoli, Kanchanjuri areas. Overnight in Kaziranga. After breakfast transfer to Guwahati airport for onward journey.TOUR ENDS HERE.